A bewitching tale about the power of friendship. Untu and the Secret of the Heart of Winter is a beautiful and beguiling picture book for the whole family. What is the secret of the light of Christmas? Tiny, elfin Untu Willi heads north from his seaside hut to unravel this mystery. On his way, he encounters a variety of animals and creatures that help him in his quest, such as Kekri, ruler of the forest,the leaf fairy Niiu, and a bear settling down for its winter’s nap. Not all of the creatures are so helpful, however. As heskis across the snowy expanses towards the fells of Lapland, Untu encounters the infamous Ironworm, who tries to thoroughly blacken Untu’s mood. Untu is not so easily discouraged, however, and in the end he achieves his goal. Atop a fell awash in glow of the northern lights, Untu meets the father of Christmas, who reveals the secret of the light of Christmas. 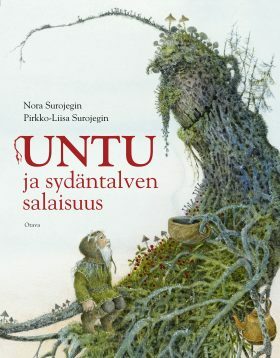 Pirkko-Liisa Surojegin is a well-known illustrator; four works featuring her illustrations have been selected as Book Pick of the Year. Her daughter Nora Surojegin is a graphic designer.